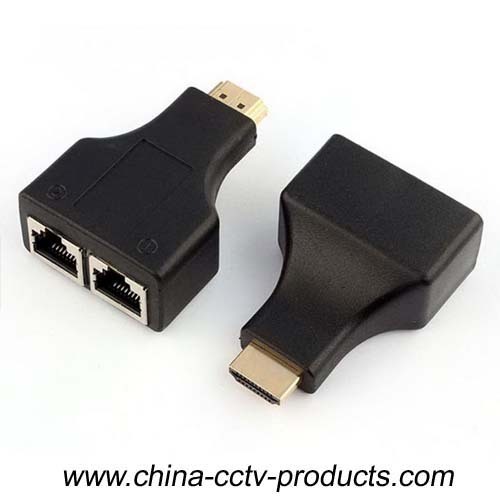 This product to extend the HDTV display up to 30 meters for 1080.It not only breaks the limitation of the HDMI cable transmission lenth, but also CAT-5e/6 has more flexibility and convenience in cable constructione. (1) Plug the fixed HDMI cable of the sender into the HDMI source such as: HD-DVD, PS3,STB etc. (2) Connect two CAT-5e/6 cables to both the output of the transmitter and input of the receiver. 3.One pair as a full functional module, no need of setting. 4.CAT-5e/6 cable can substitute HDMI cable to achieve long distance transmission. 6.Transmission distance can be up to 30 meters for 1080p using CAT-6 Cable. 8. Signaling rater up to 1.65Gbps in support of 1080p display.